President Abdel Fattah al-Sisi visited the German Federal Presidency Palace for his second day in Germany to meet with German President Frank-Walter Steinmeier. Steinmeier welcomed Sisi’s visit to Germany, expressing hope to maintain constructive relations with Egypt, which he sees as a key pillar of stability in the Middle East, Spokesman for Egypt’s presidency Bassam Rady said. President Sisi in turn welcomed his meeting with the German president and stressed the closeness of Egypt-Germany relations on the basis of their mutual interests. Rady added that during the meeting Sisi reviewed the latest developments in Egypt with regard to security and stability, and the steps taken to push for economic development. Sisi stressed Egypt’s keenness to continue cooperating with Germany through pumping more German investments in Egypt to take advantage of the major projects being implemented, Rady said. The German president also expressed his country’s keenness to promote cooperation with Egypt in various fields and to support Egypt’s efforts in its quest for development. The meeting discussed a number of issues of common concern, such as Egypt’s counter-terrorism efforts and counter illegal immigration efforts. Sisi said that Egypt is exerting great efforts in these two areas, which affect the stability and the security of the Mediterranean and Europe. According to Rady, the two presidents discussed the latest developments in the Palestinian cause, as well as the Libyan and Syrian crises. Sisi asserted Egypt’s interest to reach political solutions to these crises in accordance with the Egyptian policy, which upholds and respects for sovereignty of each country on its territories. 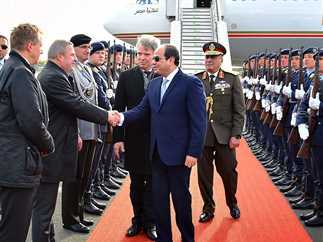 Sisi then invited the German president to visit Egypt, a gesture welcomed by Steinmeier who expressed appreciation and respect for Egypt and its leadership.